Mounting a new light fixture or other item onto a clapboard or vinyl sided home can be problematic due to the fact that the house siding is not a flat surface. In the case of a light fixture you can use a specially moulded light weight house siding mounting bracket that sits over the clapboard. You can find these types of house siding mounting brackets at most home improvement centers. However for heavier or larger items, such as dish antenna mounts, water hose reels, and hanging plant hooks, these standard moulded house siding mounting brackets are either too small or not sturdy enough. Consequently for these types of items you have little choice but to cut a hole in the house siding to mount a flat mounting block. 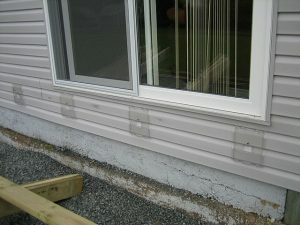 Cutting a hole into siding is not easy to do and doing so frequently leads to water and insect infiltration problems. A similar situation exists when building a deck. 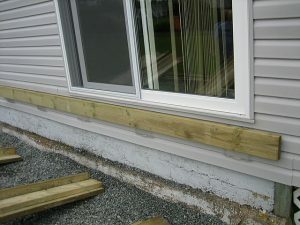 Building a deck onto an existing home typically requires a swath of siding to be removed to attach the ledger board to the side of the home. This swath is normally the width of the ledger board, which could be a 2×10, that runs the length of the deck along the side of the home. Unfortunately, creating this opening in the siding frequently leads to water problems down the road. Rain water dripping onto the deck frequently finds its way behind the back of the ledger board where it ends up rotting the house sheathing and sill. Flashing can prevent this, but not always. There is, however, an innovative solution today that addresses these heavy load house siding mounting applications. 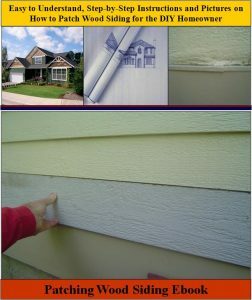 Learn how to patch wood siding with this instructive eBook that is loaded with helpful pictures. There is a family of Siding Saver mounting brackets available that are constructed out of a steel strength Makrolon Polymer, the same stuff that riot shields and safety equipment are made out of. See Siding Saver to learn more. The Siding Saver mounting brackets are specially moulded to slip over the width of 1 or 2 vinyl, aluminum or wood siding clapboards to create a flat mounting surface. As a result, the house siding does not need to be cut, thus protecting the home from potential water and insect damage, and saving time in the fixture or ledger board installation. Siding Saver mounting brackets are Ultra Violet (UV) resistant and come in a variety of styles and sizes to fit most clapboard siding applications. And because of their steel strength they are perfect for heavy load applications such as deck ledger boards. In terms of colors, Siding Saver mounting brackets are available only in “Clear”. However they can be painted using a Krylon Fusion paint. So if you have plans for installing a large heavy load item onto the side of your home, take a look at Siding Saver mounting brackets. You’ll save time mounting the fixture and more importantly protect your home from the risks of water and insect infiltration.